Callosum meaning "thick skin" this is a late flowering species discovered by Mr. Henry in the Tangtse gorges. 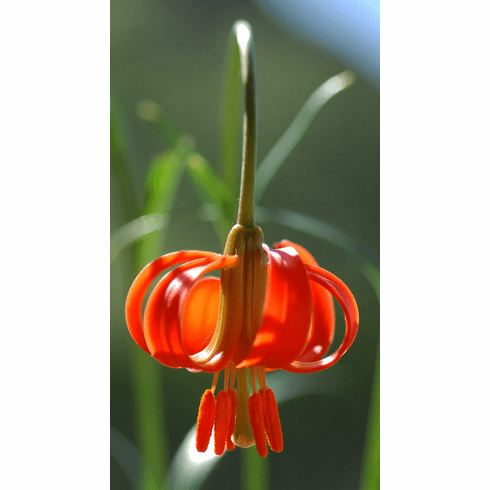 Having perhaps the widest range of any the Asian species, bulbs of Lilium callosum are rarely found in commerce now. An excellent candidate for well drained rock gardens, the small nickel sized brick to orange-red turk's cap flowers carry a delightful fragrance and seems to be rather resistant to virus infection. Easily grown from seed which is immediate epigeal in germination. Inset photo was contributed by Gene Mirro. Copyright Gene Mirro, all rights reserved. Used with permission.